I’m delighted to welcome Jackie Buxton to my blog today. Jackie is currently celebrating the launch of her brand new novel, Glass Houses, and is sharing some of the background- and a juicy extract- with us today. ‘When she sent that text, all our lives changed for ever…’ 51 year old Tori Williams’ life implodes when she sends a text while driving on the M62 motorway and allegedly causes the horrific crash in which three people die. Public and press are baying for her blood, but Tori is no wallflower and refuses to buckle under their pressure or be a pariah in society. Instead, she sets about saving the nation. But can she save Etta, the woman who saved her life? Or will Etta’s secret be her downfall? This incredibly topical and contemporary morality tale appeals across generations and will find favour with fans of authors such as Liane Moriarty, Marian Keyes and Kathryn Croft. Many years ago, the picture of a car crash, with a woman slumped over the steering wheel, and a stranger holding her hand until the emergency services arrived, pressed itself into my brain so forcefully that I was worried I was having a premonition about a real life incident. I wasn’t, thankfully. Instead, it seemed the gods of book writing had sent me the idea for my novel: one with a guilty protagonist, who could be any one of us. As I started to plot Tori’s character, a driver who texts from the wheel and becomes Public Enemy Number One, I realised that two separate news items were really behind the car crash image. The first was the face of Gary Hart, the driver of the Land Rover involved in the Selby rail crash in 2001. He’d had little sleep the night before, chosen to drive the next day, and fallen asleep at the wheel with the most tragic of consequences. It was a horrendous scene. 10 people died, 82 were seriously injured and Gary Hart survived. He was public enemy number one. But when I saw his face in the media, I kept thinking that his wasn’t the face of a killer, it was the face of someone who’d done something stupid, selfish perhaps, but not intentional. His life would also be changed forever. Maybe he didn’t need us to chastise him any more than he would chastise himself. It was easy to criticise him – he doesn’t come across well in front of the camera – and people did. But I couldn’t help thinking that I’d driven tired before. I’d been lucky. There was no perfect storm for me, I managed to get off the motorway before something catastrophic happened and we all lived to see another day. I wondered if Gary Hart was any more guilty than I was, just because the consequences of his actions were so very different. The second news item was the film of the charismatic mother of a boy who’d been killed in the 7/7 London bombing in 2005. She stood on a box in a crowd and everybody listened. She wasn’t talking vengeance, hatred and justice, she was talking about forgiveness. I was struck by how much more powerful and effective this type of reaction was, than the undoubtedly human and more usual reaction of anger and revenge. This shot me back to a childhood thought which has appeared and re-appeared all though my life. It’s the paradox of the human condition. How often do we hear people say, Oh, we all make mistakes,’ and, ‘Nobody’s perfect, we all have our foibles,’ and yet we see families feuding, colleagues resigning and neighbours not speaking because they are not able to forgive someone who didn’t behave ‘perfectly’. Sometimes this anger lasts a lifetime and beyond. As a child, and a rather idealistic adult, I couldn’t help feeling that the world would be a better place if we didn’t get quite so cross or, perhaps more importantly, we endeavoured to become ‘uncross’ as quickly as possible. By the way, I’m not pretending I’m perfect. That’s the point, really. I wanted to explore forgiveness, guilt and atonement and the image of the woman slumped over the wheel, with a stranger willing her to stay alive, gave me Tori and Etta and the framework to get started. I chose a text sent from the motorway to be Tori’s crime. I wanted it to be something that was a conscious act that most of us would find abhorrent, and yet if we looked closer, we might find we’d done similar ourselves. I wanted to play with this phenomenon that people can be guilty because it happened and not guilty because it didn’t. 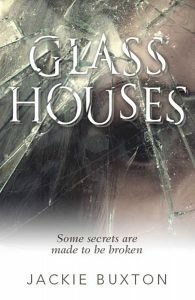 My dream for Glass Houses is that as well as being entertained by Tori and Etta’s stories, not to mention Tori’s antics as she clumsily tries to re-build her life and Etta’s ability to self-destruct, readers will be interested in this conundrum, too. THERE WAS BLOOD on the steering wheel. Etta stared at her fingers as they gripped the rim. She uncurled them, flexed them in and out, then turned over her hands to examine the grooves in her skin. She smiled – a surface wound. Just a surface wound. Her half-chewed nails had plunged into her palms. She patted her face, her arms, her legs: everything was in place. Her neck was stiff but it moved. Her feet ached so she lifted one and carefully replaced it, then lifted the other. Nothing broken. She undid her seatbelt, leaned back against her seat and forced out a long, whistling sigh. “Thank you,” she whispered, looking up as if to acknowledge the powers-that-be who’d looked after her. She wrinkled her nose. Her eyes darted to the foot well where she saw her flask smashed into too many pieces to count, drowned in a puddle of milky coffee. She reached for her phone where it had fallen, narrowly missing the liquid, but she froze before she could lift it to her ear. Her engine had cut and the radio silenced but it was more than that. She placed the phone on her lap. The silence was too loud. In the rear-view mirror she saw stationary vehicles. She held her breath, cast her eyes to the side, to the stream of cars travelling as if in slow motion in the other direction. Tentatively she turned back to the front. The smashed side window of the Jeep was only a few paces ahead of her. She dropped her phone, stared at the door to the Jeep which had come away in her hand. It was heavy. She let it fall and covered her ears as it smashed against the ground. She bent down to look inside the Jeep. Her body crumpled and she sank to her knees. Jackie Buxton is a writer, editor and teacher of creative writing, living in Yorkshire with her husband and two teenage daughters. Jackie used her recent experience of an aggressive form of breast cancer to inform and dispel some myths about a cancer diagnosis via her popular blog: Agenthood and Submissionville. 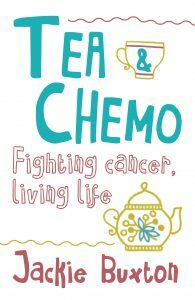 Her posts became the frame-work of self-help memoire, Tea & Chemo (Urbane Publications, November 2015) which receives heart-warming feedback, and has a five star rating from over 75 reviews. Jackie’s award-winning short stories can be found in three anthologies, as well as appearing regularly in Chase Magazine. When not writing or reading, over-seeing house and teens, Jackie can be found running, cycling or tripping up though the beautiful Yorkshire countryside. Many thanks for dropping by today Jackie. Good luck with your new novel.